An outdoor adventure awaits you at Columbus County Park! Rolling hills, forest trails, prairie meadows and the beautiful Belle River are what give Columbus County Park that “up north” feel. The natural features of Columbus County Park make it a great place to enjoy trail walking, bird watching, fishing, horseback riding and mountain biking. In the winter, it’s a great place to enjoy winter sports such as sledding and cross country skiing. The park is located in the southwest part of the county, two miles north of Gratiot Road on Bauman Road. The main park entrance is located on the west side of Bauman Road north of the railroad tracks. A rustic two-mile looped trail is located on the north side of the Belle River and consists of mowed grass, farm lanes and two-track. On the south side of Belle River, a rustic nature trail has been added that goes along the scenic Belle River, through wetlands and maple forest. The looped nature trail is accessible from the Big Hand Road parking lot. A separate looped equestrian trail provides opportunities for horseback riders. A park lodge with modern restrooms, rental facilities and a picnic pavilion is located near the main parking lot and sledding hill. Please call the parks office for reservation information at (810) 989-6960. All improvements at Columbus County Park are paid for with St. Clair County Parks and Recreation millage funds. 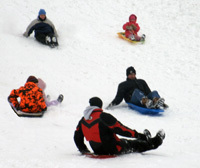 Please note the sledding hill at Columbus County Park is open to the public, weather permitting. During the winter months, these amenities may be periodically closed for maintenance, lack of snow or mild temperatures. For current sledding or skating conditions please call 810-989-6960. The lighted sledding hill is open daily from 8:00a.m. to 7:45p.m. The 411-acre park is open to the public daily from 8 am to 9pm May through September and 8am to 8pm October through April. For more information on Columbus County Parks call (810) 989-6960.